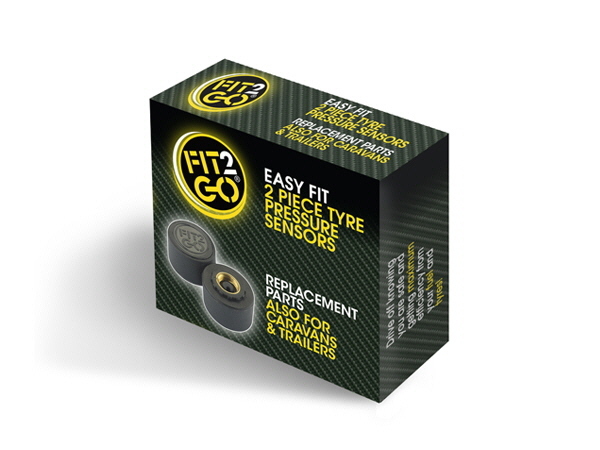 This is a pack of two replacement TPMS sensors which will be fully compatible with any Fit2Go Receiver you may have. Fitting could not be simpler, as these sensors are designed to automatically pair with your current receiver. This pack of two sensors could also be used for cases where additional wheels are added to the system in the form of a caravan or trailer. Accelerometer. The addition of an accelerometer to our product allows the sensor to sleep when stationary for a period of time, then wake up once the journey starts resulting in battery saving. Tyre Pressure Auto Calibration. ALWAYS ENSURE THE TYRE PRESSURE IS CORRECT PRIOR TO FITTING THE TPMS SENSORS. This is because the TPMS Sensor will automatically calibrate to that tyre pressure. This is unique to competitor systems where the input of the tyre pressure is needed into complicated, bulky monitor style receivers. Flashing LED When your Receiver alarms you of a problem with your tyres, the TPMS Sensor is cleverly fitted with LEDs which will flash on and off to indicate which tyre has a potential issue.